1. Discern the difference between data tables and layout tables. 5. Create a table for layout. 6. Learn how to nest a data table within a layout table. 1. Data table -purpose is to align text and number in columns and rows. a. high light the number of rows and columns you want and release. A table grid will appear with the number of row and columns you selected. 7. Cell padding is the distance between the contents of a cell and the edged of the cell. 10. In the table properties you can set table size, layout, borders, background colors or picture, layout tools, and Set. 11. To insert a row. click anywhere in last table cell and touch the tab key which will create another row or click on table in the menu bar, pint to insert, then choose. 13. Enter the size and color for the interior grid. 16. A layout table can be created by table draw feature or from the template gallery of table layouts. b. Click task panes, click layout tables. You will see in the bottom left hand corner of the screen. c. Select the layout that you want. e. Select the format you want. 19. 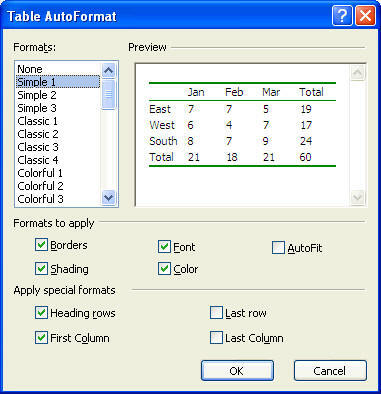 Table toolbar offers many option for formatting the table. 23. Merge a group of cells spans multiple columns or rows. 25. A table caption is a title that appears either above or below a table.